I have yet to take the Crisis Management course through IMC, but I can imagine that this recent story will be one of the topics discussed among the class. 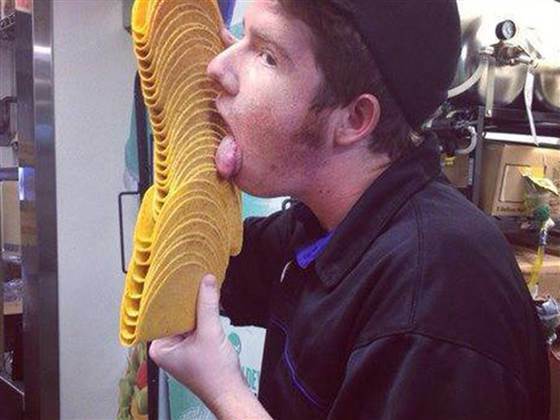 A Taco Bell employee posted a photo of himself licking a stack of taco shells onto his Facebook account. My personal thoughts after reading the article are that Taco Bell could have reacted in a better way, mostly by providing a better statement. “We’re currently dealing with it,” Cathy Marx, the manager of the Taco Bell in Ridgecrest., Calif. told CNBC in a brief interview. “We’re dealing with it”?!?!?!? That’s it??? You better be dealing with it! The public wants to know if you fired the employee first and foremeost. Not only that, but how does the manager or spokesperson plan to recover? Is it best to just brush something like this under the rug and hope and pray that the media doesn’t get ahold of it and it go viral? I don’t think so! To me, it sounds like Taco Bell should be looking into store manager as well as the actual employee to better prepare him for being an effective leader for his staff, as well as coaching him on how to respond to a crisis. This entry was posted in Emerging Media and tagged business, crisis, crisis management, leadership, leadership development, taco, Taco Bell by Crystal. Bookmark the permalink.